Not everybody has the available floor space or audiophilic conviction for 9.1 surround sound—sometimes just a sound bar or even headphones may suffice. With the wall of sound-producing devices that LG just unveiled, finding a system to match your situation should be a cinch—even if it is 9.1 surround. LG's new lineup of A/V devices is expansive with new models of surround systems, sound bars, net-connected 3D Blu-Ray players, docking and portable speakers. The company's new top-of-the-line Home Theater System, the BH9430PW, reportedly rivals the quality of proper cinema theater audio. The 9.1 surround system features Aramid fiber (a Kevlar-based material) cones, front tallboy and wireless rear satellite speakers as well as four additional mid-range channels. What's more, it can stream audio over a Wi-Fi connection to your smartphone with the Private Sound Mode feature so that you can listen through standard earbuds and not disturb your roommates, mirror content from NFC-enabled devices and Apple phones and tablets. It even includes Smart TV functionality so that you can browse the web and access streaming content even if you don't also own an LG television. The three lesser models include varying combinations of these features, check out the table below for details. 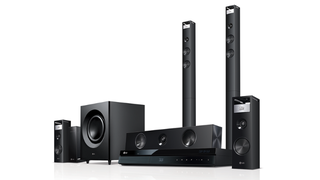 As for sound bars, LG now offers four models. These 2.1 sound systems are designed to produce strong audio without taking up the space that its HTS models require. The bars feature 40 to 310W speakers, depending on the model, the premium of which, the NB4530A, packs them into a minuscule 1.38-inch tall, wall- or stand-mountable profile optimized for 47-inch class screens. These also all boast HDMI with an Audio Return Channel (HDMI ARC) ports and Bluetooth-connectivity for streaming audio from mobile devices. Oddly, its the penultimate model, the NB3730A, that offers streaming content from Netflix, Pandora, and vTuner rather than the NB4530A. LG's new premium 3 Blu-ray Player, the BP730, now boasts dual core processors, Video on Demand content from Hulu Plus, Pandora, and Netflix, web browsing through its Smart TV capabilities, and even NFC-based content mirroring. Oh yeah, and it also plays Blu-Ray discs in case anyone still cares about that. For those looking for speakers without the attached television, LG has some new offerings as well. The company's marquee ND8630 Dual Docking Speaker can connect with both iOS and Android mobile devices, outputting music through 80W speakers while charging the attached device. The dock supports both Bluetooh and Air-Play, automatically recognizing and queueing music—wirelessly—from nearby mobile devices. It's even got a Mood Lamp option that throws out soft ambient light in case just sitting there and enjoying your music isn't enough. LG is also rolling out a new portable speaker option as well—the 20W NP6630. It supports NFC, AirPlay, and Bluetooth. Please note that the top art is of the BH9420PW HTS. We'll update it with the current model shortly.